For methods of transferring an image onto a 3D surface, see pad printing. For methods of generating autostereoscopic lenticular images, see lenticular printing andholography. 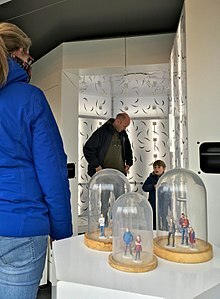 3D printing is any of various processes in which material is joined or solidified under computer control to create a three-dimensionalobject, with material being added together (such as liquid molecules or powder grains being fused together). 3D printing is used in bothrapid prototyping and additive manufacturing. Objects can be of almost any shape or geometry and typically are produced using digital model data from a 3D model or another electronic data source such as an Additive Manufacturing File (AMF) file (usually in sequential layers). There are many different technologies, like stereolithography (SLA) or fused deposit modeling (FDM). Thus, unlike material removed from a stock in the conventional vowin.cn/en/News/news1251.html' target='_blank'>machining process, 3D printing or Additive Manufacturing builds a three-dimensional object from computer-aided design (CAD) model or AMF file, usually by successively adding material layer by layer. The term "3D printing" originally referred to a process that deposits a binder material onto a powder bed with inkjet printer heads layer by layer. More recently, the term is being used in popular vernacular to encompass a wider variety of additive manufacturing techniques. United States and global technical standards use the official term additive manufacturing for this broader sense. The umbrella term additive manufacturing (AM) gained wide currency in the 2000s, inspired by the theme of material being added together (in any of various ways). In contrast, the term subtractive manufacturing appeared as a retronym for the large family ofmachining processes with material removal as their common theme. The term 3D printing still referred only to the polymer technologies in most minds, and the term AM was likelier to be used in metalworking and end use part production contexts than among polymer, inkjet, or stereolithography enthusiasts. By the early 2010s, the terms 3D printing and additive manufacturing evolved senses in which they were alternate umbrella terms for Additive Manufacturing technologies, one being used in popular vernacular by consumer-maker communities and the media, and the other used more formally by industrial Additive Manufacturing end-use part producers, Additive Manufacturing machine manufacturers, and global technical standards organizations. Until recently, the term 3D printing has been associated with machines low-end in price or in capability. Both terms reflect that the technologies share the theme of material addition or joining throughout a 3D work envelope under automated control. Peter Zelinski, the editor-in-chief of Additive Manufacturing magazine, pointed out in 2017 that the terms are still often synonymous in casual usage but that some manufacturing industry experts are increasingly making a sense distinction whereby Additive Manufacturing comprises 3D printing plus other technologies or other aspects of a manufacturing process. Other terms that have been used as Additive Manufacturing synonyms or hypernyms have included desktop manufacturing, rapid manufacturing (as the logical production-level successor to rapid prototyping), and on-demand manufacturing (which echoes on-demand printing in the 2D sense of printing). That such application of the adjectives rapid and on-demand to the noun manufacturing was novel in the 2000s reveals the prevailing mental model of the long industrial era in which almost all production manufacturing involved longlead times for laborious tooling development. Today, the term subtractive has not replaced the term machining, instead complementing it when a term that covers any removal method is needed. Agile tooling is the use of modular means to design tooling that is produced by additive manufacturing or 3D printing methods to enable quick prototyping and responses to tooling and fixture needs. Agile tooling uses a cost effective and high quality method to quickly respond to customer and market needs, and it can be used inhydro-forming, stamping, injection molding and other manufacturing processes. 1981 : Early additive manufacturing equipment and materials were developed in the 1980s. In 1981, Hideo Kodama of Nagoya Municipal Industrial Research Institute invented two additive methods for fabricating three-dimensional plastic models with photo-hardening thermoset polymer, where the UV exposure area is controlled by a mask pattern or a scanning fiber transmitter. 1984 : On 16 July 1984, Alain Le Méhauté, Olivier de Witte, and Jean Claude André filed their patent for the stereolithography process. The application of the French inventors was abandoned by the French General Electric Company (now Alcatel-Alsthom) and CILAS (The Laser Consortium). The claimed reason was "for lack of business perspective". Three weeks later in 1984, Chuck Hull of 3D Systems Corporation filed his own patent for a stereolithography fabrication system, in which layers are added by curingphotopolymers with ultraviolet light lasers. Hull defined the process as a "system for generating three-dimensional objects by creating a cross-sectional pattern of the object to be formed,". Hull's contribution was the STL (Stereolithography) file format and the digital slicing and infill strategies common to many processes today. 1988: The technology used by most 3D printers to date—especially hobbyist and consumer-oriented models—is fused deposition modeling, a special application of plasticextrusion, developed in 1988 by S. Scott Crump and commercialized by his company Stratasys, which marketed its first FDM machine in 1992. AM processes for metal sintering or melting (such as selective laser sintering, direct metal laser sintering, and selective laser melting) usually went by their own individual names in the 1980s and 1990s. 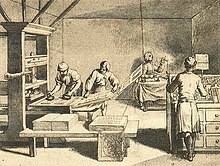 At the time, all metalworking was done by processes that we now call non-additive (casting, fabrication, stamping, and machining); although plenty of automation was applied to those technologies (such as by robot welding and CNC), the idea of a tool or head moving through a 3D work envelope transforming a mass ofraw material into a desired shape with a toolpath was associated in metalworking only with processes that removed metal (rather than adding it), such as CNC milling, CNC EDM, and many others. But the automated techniques that added metal, which would later be called additive manufacturing, were beginning to challenge that assumption. By the mid-1990s, new techniques for material deposition were developed at Stanford and Carnegie Mellon University, including microcasting and sprayed materials. Sacrificial and support materials had also become more common, enabling new object geometries. 1993 : The term 3D printing originally referred to a powder bed process employing standard and custom inkjet print heads, developed at MIT in 1993 and commercialized by Soligen Technologies, Extrude Hone Corporation, and Z Corporation. 1995: In 1995 the Fraunhofer Institute developed the selective laser melting process. 2009: Fused Deposition Modeling (FDM) printing process patents expired in 2009. As the various additive processes matured, it became clear that soon metal removal would no longer be the only metalworking process done through a tool or head moving through a 3D work envelope transforming a mass of raw material into a desired shape layer by layer. The 2010s was the first decade in which metal end use parts such as engine brackets and large nuts would be grown (either before or instead of machining) in job production rather than obligately being machined from bar stock or plate. It is still the case that casting, fabrication, stamping, and machining are more prevalent than Additive Manufacturing in metalworking, but Additive Manufacturing is now beginning to make significant inroads, and with the advantages of design for additive manufacturing, it is clear to engineers that much more is to come. 2013: NASA employees Samantha Snabes and Matthew Fiedler create first prototype of large-format, affordable 3D printer, Gigabot, and launch 3D printing company re:3D. 2018: re:3D develops a system that uses plastic pellets that can be made by grinding up waste plastic. 3D printable models may be created with a computer-aided design (CAD) package, via a 3D scanner, or by a plain digital cameraand photogrammetry software. 3D printed models created with CAD result in reduced errors and can be corrected before printing, allowing verification in the design of the object before it is printed. The manual modeling process of preparing geometric data for 3D computer graphics is similar to plastic arts such as sculpting. 3D scanning is a process of collecting digital data on the shape and appearance of a real object, creating a digital model based on it. A step in the STL generation known as "repair" fixes such problems in the original model. Generally STLs that have been produced from a model obtained through 3D scanning often have more of these errors. This is due to how 3D scanning works-as it is often by point to point acquisition, reconstruction will include errors in most cases. Printer resolution describes layer thickness and X–Y resolution in dots per inch (dpi) or micrometers (µm). Typical layer thickness is around 100 μm (250 DPI), although some machines can print layers as thin as 16 μm (1,600 DPI). X–Y resolution is comparable to that of laser printers. The particles (3D dots) are around 50 to 100 μm (510 to 250 DPI) in diameter. For that printer resolution, specifying a mesh resolution of 0.01–0.03 mm and a chord length ≤ 0.016 mm generate an optimal STL output file for a given model input file. Specifying higher resolution results in larger files without increase in print quality. The layered structure of all Additive Manufacturing processes leads involuntarily to a strain-stepping effect on part surfaces which are curved or tilted in respect to the building platform. The effects strongly depend on the orientation of a part surface inside the building process.